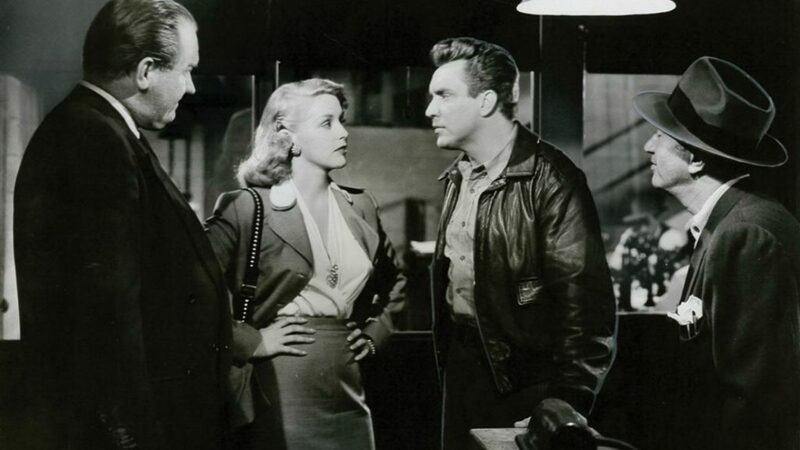 Edmond O’Brien leaves a nice steady job at the phone company to work for a crime boss. It’s not exactly all on the up and up, but there’s more money in it for him. With O’Brien’s knowledge of electronics he becomes an invaluable asset as he sets up a broadcast system for bookies and he helps the boss’ profits rise. When the boss is murdered O’Brien assumes the top position of this organization and is loving the cushy, powerful life he’s found himself in. Subsequently O’Brien makes a rotten deal with a rival gang and wants an out when he realizes it’s costing him more than it’s worth. Now in the grip of greed, O’Brien attempts to cancel this unbreakable deal with a slight case of murder. Suspicion is cast on him by his betrayed partners and the pressure starts to mount, along with the police Gangster Squad who are focused on ending O’Brien’s criminal run. When 711 Ocean Drive begins it looks like it will be something of a unique crime film with the premise of an electronics whiz ingratiating himself with a crime boss and lending his specialized talents to his gambling operation. Thanks to O’Brien’s audio and electronic know-how he manages to revolutionize this racket and make profits soar. This must of been some pretty cutting edge stuff to see in 1950. Microphones, antennas, phone lines, this seems like some pretty high-tech stuff in the world of old school gangsters. However, as the film progresses it becomes a more standard crime story of a characters’ rise and fall in the underworld that isn’t really that memorable, other than the climactic chase at the Hooever Dam. O’Brien is fine as usual. He’s begins as an optimistic working man who feels he just hasn’t been lucky with landing a gig that will pay him handsomely. Once he becomes entangled in a life of crime he becomes more jaded, paranoid and cut throat as his responsibilities grow. It’s an arc we’ve seen many times before, but O’Brien gives it his all and is really the one major element that kept up the momentum of the movie for me. It’s a very routine story however. With the more success he gets, the more attention O’Brien draws to himself. Gangsters from the east want a piece of his action. At first their offer sounds good, until O’Brien learns he’s getting stiffed, but by then it’s too late to pull out of it. Plus, the police unit called the Gangster Squad has got their eyes on him and are closing in. O’Brien is smart and makes it hard for them to pin much on him, but that will only last for so long. As the film unspooled none of this was done in any kind of a special enough way that made me get really engaged by it. The investigation by the police felt like it was just going through the motions and not a very remarkable part of the story., The actors in the Gangster Squad crew also weren’t particularly memorable. Actually, other than O’Brien most of the cast were somewhat forgettable in this. There are some nice location shooing that show off the period of 50’s L.A. and Vegas. 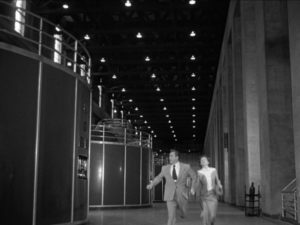 The big standout scene is the climax at the Hoover Dam. They really used the access they got for filming there to make a nice impressive ‘closing-in’ chase sequence. So, while I felt 711 Ocean Drive was just floating along for most of its run time, the ending scene gave it a much needed bump for me. There were also two small observations I had with 711 Ocean Drive. 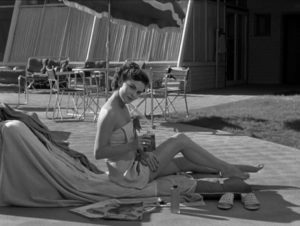 One was learning the leading lady Joanne Dru, was the same actress who appeared in one of my favorite guilty pleasure movies Super Fuzz thirty years later! I had no idea and would never have made the connection had I not been looking up information about the movie while watching it. She was quite the looker back then. The second was realizing at the end of the movie I had no idea why the film was called 711 Ocean Drive. I don’t remember the address ever being mentioned and the significance of it was lost on me.